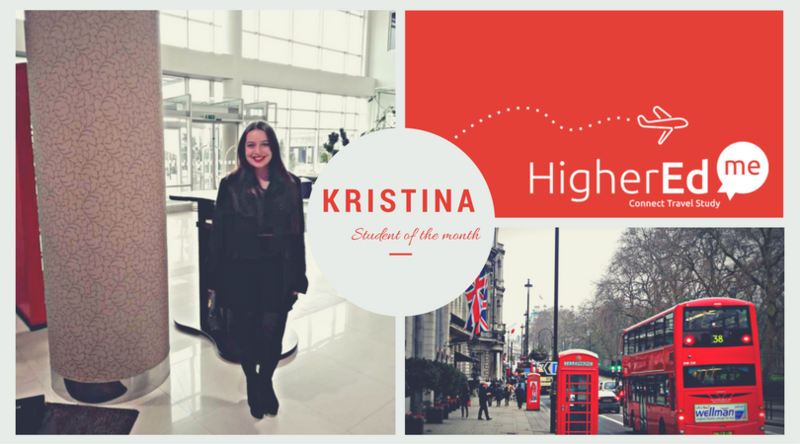 Kristina is the Student of the Month! At HigherEdMe, we are always looking for motivated students. That is why I decided to get in touch with Kristina, whose profile was really interesting as she was quoting Saint Augustine. She was nice enough to let me interview her and I really thank her for that. [HigherEdMe] You want to study medicine in the UK. Why did you choose the United Kingdom to study in your field? [Kristina] I’ve always been interested in studying medicine. When I had to write where I wanted to study it in my profile, I said in the UK because I think that is one of most competitive places to learn medicine. But I actually wouldn’t mind any country that would give me opportunities to learn things that I can’t learn here in Montenegro. I love my country but because it’s small and because we don’t have big population I won’t get to see and learn many things that I would be able to learn in the UK or any other big country. So to answer your question, it’s not the UK but the opportunities that such a big country with such big universities can give me, that interest me the most. When I was little I always told my parents that I would travel and see the world, that is like my second dream. In my country, there is a saying that goes : ’’Svuda podji ali kuci dodji”, it means :’’Travel everywhere but in the end come home’’. It’s one of my ambitions in life : I want to travel everywhere and see many things, meet different people and see their traditions because I’m a little old-fashioned and I love traditions. I’d love to learn different things and then come back to my country and make a difference here because I think we need more people to come back after going away. [HigherEdMe] Medicine can lead to a lot of different jobs, what job would you like to study it for? And why? [Kristina] As far as I remember, whenever someone asked me what I wanted to be when I grew up, I always said doctor. At first, I didn’t really know what being a doctor really meant and when I started high school I finally discovered what it really meant. Being a doctor is not just some fancy job that gets you respect from others but I really want to help other people, people like an old lady that is abused by her family and has to go to the hospital. I saw that lady and I will never get that image out of my head. As for what field in medicine I want to study in, I still haven’t decided and I think that it’s early to decide now (I really like kids so maybe pediatrics). [HigherEdMe] If you couldn’t study medicine, what other fields would you like to be in? [Kristina] I don’t know what else I would study. I mean I worked so hard to get where I’m today and always with one goal in mind and that is to be a doctor one day. My family always encouraged me to do what I really love and I love medicine. [Kristina] I would describe my dream school as a very big school where many people of different origins, religions, cultures and countries study and get to learn everything about each other. I could go on about this forever. [HigherEdMe] I’d like to know more about your hobbies and what gets you excited. What do you enjoy doing when you have spare time? [Kristina] I love reading and whenever I can get a little time I read. When I was in high school I always had different projects (Organ Transplantation, Hypnosis, Multiple Personality Disorder and so on) and I loved doing every single one of them. I also organized many school events. Some of them were : The Open Door Day, The Language Day, The Diabetes Day… And one of the things that gave me a lot of satisfaction is volunteering for the Red Cross with my best friend. [HigherEdMe] Is there a personality trait about you that you are proud of? What is it and why? [Kristina] I’m very persistent and I won’t give up no matter what happens. [HigherEdMe] If there is anything you’d like to say to Universities who will see your profile or if you want to add something, feel free to do it. [Kristina] I don’t know if you liked my profile but don’t judge me before you meet me! Thanks again to Kristina for her wonderful interview! If you want to create your study abroad project just like her, you should create an account on our platform here. And if it’s already done and you want to get the chance to be even more noticed by Schools by getting interviewed, contact me on Facebook!